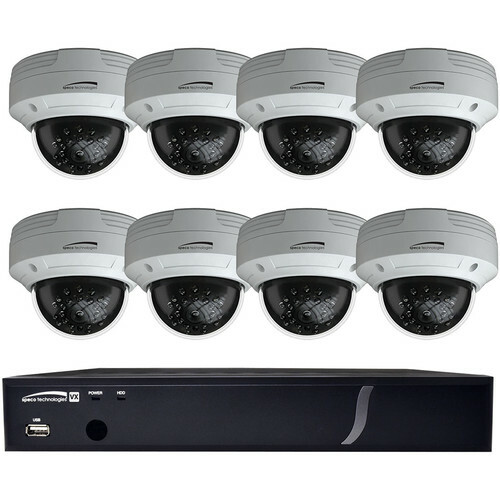 Monitor your property with the 8-Channel 4MP HD-TVI DVR with 2TB HDD & 8 2MP HD-TVI Dome Cameras from Speco Technologies. The 8-channel DVR manages and can record from up to 8 cameras. It comes with a 2TB HDD preinstalled. HDD capacity is expandable to 8TB if more storage space is required. H.264 video compression reduces bandwidth requirements for efficient data storage while maintaining the best possible video quality. 4 audio inputs and 1 output enable two-way audio communication. Remote access via an iOS or Android device and Windows or Mac PCs is possible thanks to SpecoTech multi-client software, SecureGuard VMS, a web viewer (IE & Firefox), and the Speco Player mobile app. The included 2MP dome cameras have a 1/3" CMOS sensor to capture 1920 x 1080 resolution video. They have a 3.6mm fixed lens with 24 IR LEDS to provide up to 32' of night vision. These cameras support HD-TVI technology, and are IP66-rated for outdoor use. The 8-Channel 4MP HD-TVI DVR with 2TB HDD from Speco Technologies features 8 BNC camera inputs that support HD-TVI analog video. It records 960H resolution per channel with up to a combined 4MP resolution (at 15 fps per channel). It includes 2TB of preinstalled HDD storage and is upgradeable to a total of 10TB. The DVR has VGA and HDMI main monitor outputs, a switchable composite/spot BNC output, and audio and alarm input/outputs. It uses H.264 compression, offers dual streaming, and is compatible with iOS and Android for remote access via your mobile device. The white HD-TVI 2MP 1080p Outdoor Dome Camera from Speco Technologies features a 1/3" CMOS sensor and 3.6mm fixed lens to capture videos at a maximum resolution of 1920 x 1080. This day/night camera provides 24-hour surveillance thanks to built-in IR LEDs with a range of up to 32’. Enclosed in an IP66-rated housing, the camera can be used for both indoor and outdoor applications. Box Dimensions (LxWxH) 5.5 x 5.4 x 5.0"